Here is my progress on garment number 1 of the year - the Tunisian Entrelac yoga top. It has been slow going. Tunisian crochet is rather time consuming and I've been so distracted by my charity crochet bobble blanket project. The additional wool that I ordered online from Jimmy Beans Wool, taking advantage of their free standard postage in February, arrived far quicker than expected. I just kept making those little bobbles. 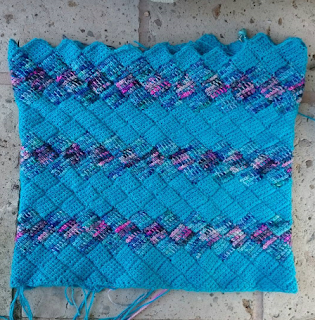 I listened to Fay on the latest Crochet Circle podcast episode just before the Super Bowl game began and found out that March 3rd is the start of their Tunisian Crochet Along. How exciting!! I've been a big fan of the Crochet Circle podcast ever since I reviewed it back in May last year. There are three different categories for the CAL which will be hosted by Sol. And my yoga top does not qualify. Boo! I need to start the project on March 3rd not beforehand. Sharing will take place on Instagram and Ravelry. Check out the show notes for further details here if you fancy taking part. It's going to be fun! http://maryheatherbrowne.com/blog/yarnlovechallenge and http://www.oharethey.com/blog/yarnlovechallenge. Being a little part of this is really brightening my day. Thank you ladies!! Hope February is going well for you too lovely readers! Wow, Tunisian entrelac looks exactly like knitting! And your top looks gorgeous. I wish I were participating in the yarn love challenge. By the time I figured out what it was, they were like 9 days in and I felt too far behind. Maybe I'll do it on my own at some point, haha. Thank you Nicole. Yes, Tunisian crochet technique is a little more like knitting than regular crochet in that you actually have the stitches on your hook. I guess that's why it looks similar. I was a little late to the love yarn challenge too. I think it would be fine to jump in still!